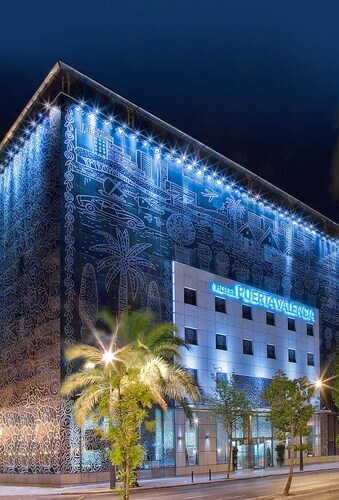 Located in Valencia City Centre, this hotel is within a 10-minute walk of City of Arts and Sciences, Palau de la Musica, and Gulliver Park. Mestalla Stadium and Polytechnic University of Valencia are also within 1 mi (2 km). Aragon Station is 8 minutes by foot and Amistat Station is 9 minutes. 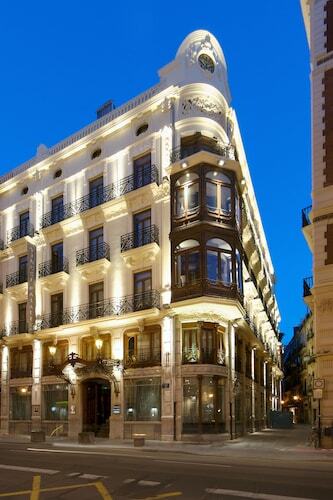 Located in Valencia City Centre, this hotel is steps from Teatro Principal and Plaza del Ayuntamiento. Plaza de la Reina and Central Market are also within 10 minutes. Colon Station is only a 4-minute walk and Xativa Station is 6 minutes. 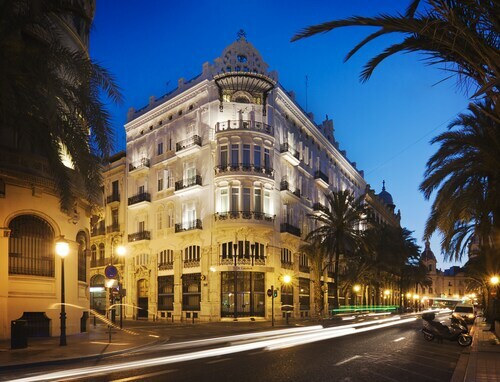 Located in Valencia City Centre, this hotel is within a 10-minute walk of Palace of the Marques de Dos Aguas, Central Market, and Cervero Palace. Serranos Towers is 0.6 mi (0.9 km) away. Colon Station is 6 minutes by foot and Valencia North Station is 10 minutes. 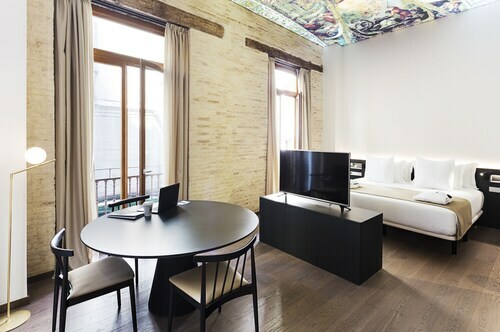 Located in Valencia City Centre, this boutique hotel is steps from Teatro Rialto Filmoteca and Plaza del Ayuntamiento. Plaza de la Reina and University of Valencia are also within 5 minutes. Colon Station is 6 minutes by foot and Xativa Station is 6 minutes. 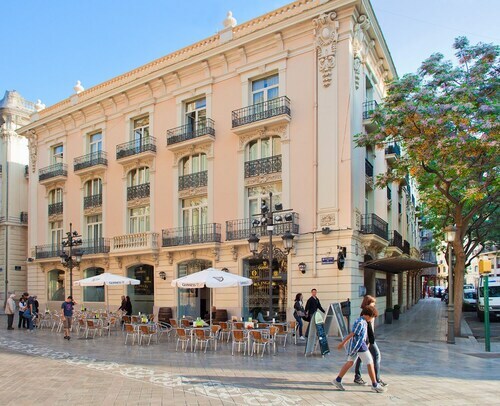 Located in Valencia City Centre, this hotel is within 1 mi (2 km) of Central Market, University of Valencia, and Plaza de la Reina. Valencia Cathedral and City of Arts and Sciences are also within 1 mi (2 km). Pl. Espanya Station is only a 3-minute walk and Bailen Station is 7 minutes. 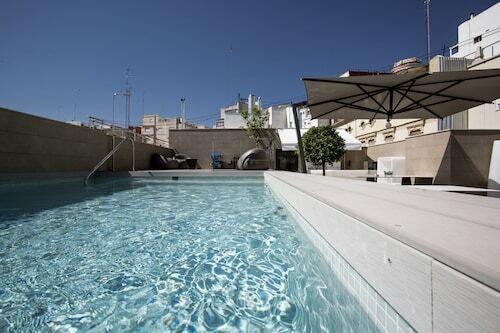 Located in Valencia City Centre, this boutique hotel is steps from Turia Gardens and Plaza de la Virgen. Plaza de la Reina and Central Market are also within 10 minutes. Alameda Station is 15 minutes by foot and Colon Station is 15 minutes. 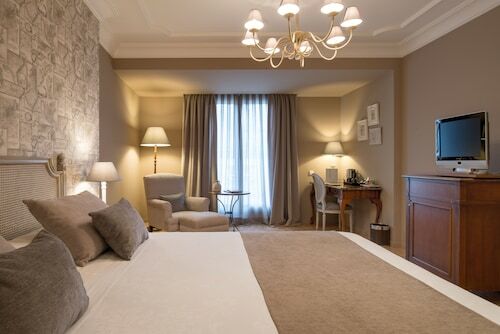 Located in Valencia City Centre, this boutique hotel is within a 5-minute walk of Teatro Olympia and Plaza del Ayuntamiento. Central Market and Plaza de la Reina are also within 10 minutes. Valencia North Station is only a 5-minute walk and Xativa Station is 6 minutes. 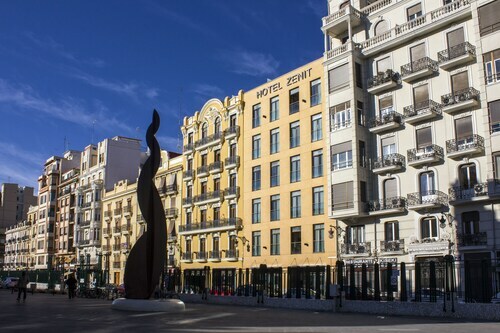 Located in Valencia City Centre, this hotel is within a 5-minute walk of Teatro Olympia, Central Market, and Plaza del Ayuntamiento. Plaza de la Reina and University of Valencia are also within 10 minutes. Xativa Station is 9 minutes by foot and Colon Station is 9 minutes. Located in Valencia City Centre, this hotel is within a 10-minute walk of Plaza de Toros de Valencia and Plaza del Ayuntamiento. Plaza de la Reina and Central Market are also within 15 minutes. Xativa Station and Valencia North Station are within a 2-minute walk. This corner of the world is full of entertaining ways to spend a day, such as a trip to Plaza del Ayuntamiento. It is in Valencia, so if you are flying into Madrid, the country's capital, you will have a journey of 190 miles (306 kilometers) to go. You'll be happy to find out that there are no less than 71 hotels within walking distance, making your hard-earned break that much easier. So many options can make it difficult to know where to begin. 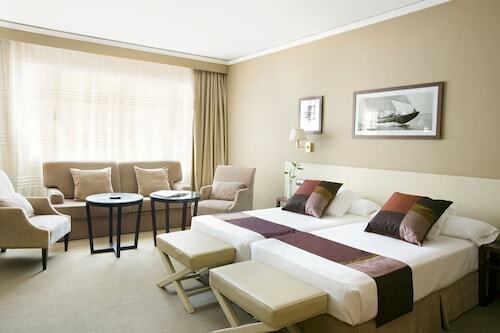 We suggest first checking out the Valencia Luxury Ático Ayuntamiento, Caro Hotel and Holastays Jardines Del Turia. Thrifty visitors are usually thankful to find out that there's a great selection of cheaper hotels. The Hostal Venecia and the Casual Valencia del Cine are two such solutions. They're 0.1 miles (0.2 kilometers) and 0.1 miles (0.2 kilometers) away, respectively. Visitors that take pleasure in the finer things will definitely be spoiled for choice by the variety of high-quality establishments available nearby. The Westin Valencia is one of best places, located 0.8 miles (1.3 kilometers) away. Alternatively, check out the Hospes Palau de la Mar, 0.5 miles (0.8 kilometers) away. Hang out, take a break and meet the locals at Macrodesperta, which is just around the corner. If you're looking for something more substantial, book a table at simsimi, another close-by establishment. If the sight of the setting sun brings about a sudden thirst, stop off at Bar Foios for an icy beer or your favorite drink on the way back to your place. Time spent admiring Valencia Town Hall will provide you with greater insight into the history and civic character of this destination. 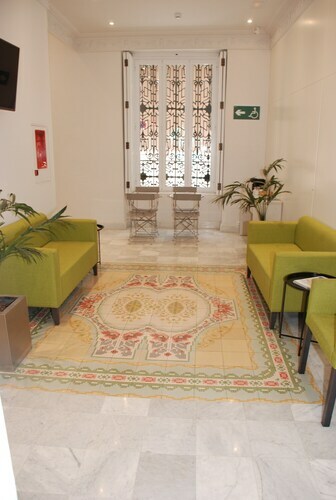 Tourist Info Ayuntamiento can provide you with all the information you need to ensure you make the most of your stay. It's worth going to see San Juan de la Cruz Church, a pleasant house of worship as well as a local landmark. If you love the atmosphere of historic buildings and structures, a scheduled tour of University of Valencia will excite your passion. Every art piece has a fascinating past. At National Museum of Ceramics and Decorative Arts "González Martí", you can check out a range of exhibits, stop for a closer inspection and find out the stories behind them. When planning your visit to Plaza del Ayuntamiento, try catching the train. The nearest station, Estació del Nord, is 0.3 miles (0.5 kilometers) away. How Much is a Hotel Room in Plaza del Ayuntamiento? 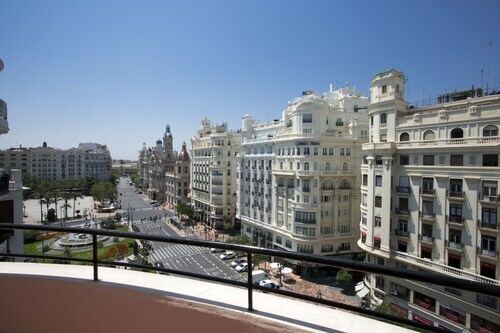 Hotels in Plaza del Ayuntamiento start at $50 per night. Prices and availability subject to change. Additional terms may apply.